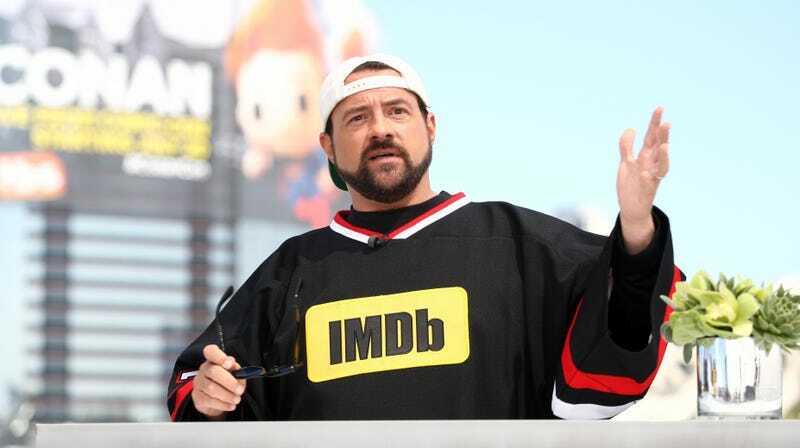 It looks like Kevin Smith has some big stuff in the works, assuming an Instagram post he made recently can be trusted. In the post, Smith said that he had just finished a “huge writing gig” that is part of the “most massive IP” he’s ever worked with. He doesn’t say what it is, naturally, but Deadline notes that a fan asked if it was Marvel Studios or Star Wars and he did shoot those down. The only other hint we have is that Smith says this will be the “biggest budgeted” thing he ever worked on, but these hints actually narrow down the options considerably. Let’s break this down: It’s a big budget thing based on a “massive” property that is not Marvel or Star Wars, and it’s coming from a famous nerd who directed episodes of Supergirl and The Flash, wrote Batman and Green Arrow comics, and scripted a failed Superman movie that would’ve starred Nicolas Cage. So what, if anything, can we discern from this evidence? Well, at the risk of overreaching, we’d have to guess that the big project Smith is working on is an impossibly big sequel to Yoga Hosers, that bad Tusk spin-off he made with his daughter. We’re just amateur detective comics here, but that seems like the most likely option to us. It's a bird! It's a plane! It's... Recommended Stories!